Transportation funding exists at the local, regional, state and federal levels. This section briefly discusses the major sources of transportation funding in California. 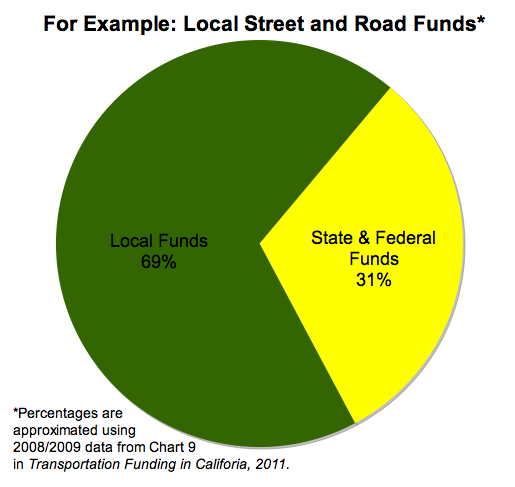 Local funds are by far the largest piece of the transportation funding pie. Local funds are used for capital and operating purposes (for example traffic enforcement) and to match federal and state sources. A substantial portion of local funding is linked to voter-approved measures with detailed plans for spending on specified projects. Over the last 25 years, voters in 19 California counties have passed local sales tax measures, generating approximately $2.5 billion per year for roadway and/or transit projects. Metropolitan planning organizations (MPOs) and regional transportation planning agencies (RTPAs) are largely responsible for planning, coordinating and distributing funds for local and regional projects. Projects listed in a metropolitan planning organization or regional transportation planning agency’s regional transportation plan (RTP) and regional transportation improvement program (RTIP) then make up the State Transportation Improvement Program. (More on MPOs, RTPAs, RTPs and RTIPs in Regional Agencies & Special Districts Roles). 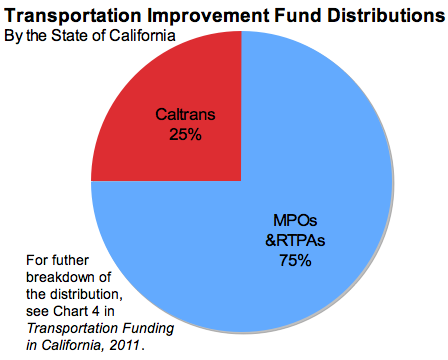 In California, metropolitan planning organizations, regional transportation planning agencies and county transportation commissions manage 75 percent of the available State Transportation Improvement Program funds (distributed through the Transportation Improvement Fund; see below). The funds available to metropolitan planning organizations and regional transportation planning agencies are called regional improvement program (RIP) funds. Though metropolitan planning organizations and regional transportation planning agencies administer 75 percent of the Transportation Improvement Fund, federal and state transportation revenues only account for roughly 30-45 percent of the funding for financially constrained regional transportation plans. State funds are used for new capital projects such as the expansion of transit networks and new highway lanes, and maintenance costs such as street and highway resurfacing. A much smaller portion covers operational costs, such as paying the salaries of bus drivers and mechanics at the local level. In addition, state funds are used to match funds for federal projects. State bond measures such as Proposition 1B in 2008 have brought in over $11 billion for congestion reduction, highway and local road improvements and public transportation. The unpredictable political nature of transportation funds, which have repeatedly been used for general purposes throughout history, leads to great uncertainty for regional and statewide planning. The State of California uses revenues from state and federal gas taxes for transportation projects through the Transportation Improvement Fund (TIF). The State Transportation Improvement Program (STIP) lists the capital projects that will receive funding, and allocates 25 percent of the Transportation Improvement Fund to Caltrans and 75 percent of the fund to metropolitan planning organizations. Provide a broad spectrum of projects to benefit many types of active transportation users. The majority of federal transportation funding is used for capital projects, such as new interstate highway and rail construction. Some of this funding goes to specific projects earmarked by Congress. The 2005 to 2009 Federal Aid Highway Program apportioned approximately $17 billion to the State of California for highway/bridge/interstate maintenance, national highway system, surface transportation, congestion mitigation air quality, and other equity and infrastructure programs. Additionally, $452 million was appropriated for safety programs, including highway safety improvements and Safe Routes to School (SRTS) programs. Federal aid transit programs included approximately five billion dollars, largely for capital transit investments. On September 26, 2013, Governor Brown signed legislation creating the Active Transportation Program (ATP) in the Department of Transportation (Senate Bill 99, Chapter 359, and Assembly Bill 101, Chapter 354). The Active Transportation Program consolidates various state and federal transportation programs, including the Transportation Alternatives Program (TAP), Bicycle Transportation Account (BTA), and State Safe Routes to School (SR2S) into a single program. Guidelines were adopted by the California Transportation Commission (CTC) in March 2014. See the Active Transportation Program section below for more details. Readers are encouraged to consult technical experts, attorneys and/or relevant regulatory authorities for up-to-date information and advice on specific situations. Cities, counties and schools can take advantage of a variety of opportunities to fund active transportation in the community. Scroll down for a brief description of each and then proceed to each topic’s individual page.